"If you want your children to be intelligent, read them fairy tales. If you want them to be more intelligent, read them more fairy tales." Albert Einstein. Traditional schooling systems around the world are jumping into more 'Structured' and "Standardized' settings like a 'RAT RACE', where children are being taught in a way that they are only learning the 'facts' and 'Rote memorizing' everything for the Ultimate goal of 'Assessments' and Examinations ...Whats really sad about all this situation is that in the process they are 'Loosing' their natural curiosity, wilderness, and above all 'Creativity' with which every child is born. As soon as they get admitted to any Early Childhood setting, the process of 'Rusting of Creativity' starts as they are not getting any chance to develop, polish and fertilize their Creativity Skills which is the main factor in determining the Success of any individual in a long run. But fortunately, there are many systems which allows the CREATIVITY FACTOR to develop, polish and get to it's maximum. In a Montessori system, Creativity matters a lot ,and there are thousands of ways to stimulate that process. One of the popular way is by creating an opportunity which inspires the child to go and make his own Imaginative stories and share it with the class. It started with the idea of a child in my class who insisted that he would bring some of his Farm animals and share it with his friends. So we all made a plan to model our farm using Cardboard . We took a big 'Cardboard' and opened it from all the sides and then spread it on the floor. The Farm base was now ready to start the activity . We started our discussion on how to make a farm, and what stuff we would be needing . After a much thought-provoking and a creative discussion , we decided to form few groups of children who will do certain tasks. The first group asked me that they wanted to fill a pot of Sand from the Sand area, I was delighted how Independently children works as against our Beliefs . After the sand was brought ,children started pouring the sand on the farm base to give it a real look. Children are deeply involved whenever they play with the sand, as if they are born to play with it . this girl enjoyed every touch of it, feeling each crystal . Whenever a hand touches the sand, it arouse the focus to get indulge in it. on the process of whatever they are doing until the goals are achieved. No artificial or induced stimulants needed. Even the new ones who are most reluctant to participate ,fully enjoys the NATURE related activities . This child sensed the Peacefulness as he came to contact the sand. Its really amazing to see the beautiful feelings in children. Creativity sprouts when children are free to play without 'undue adult supervision'. She is a kind of child who loves doing things actively and when it comes to make a story ,she just couldn't love it more. She calmed down after the sand interaction ,amazing Nature effect! Even the most highly hyperactive child immersed deeply into the world of Sand. Children have the ability to experience the tiniest and smallest thing and process it perfectly with the utmost care, they don't need the Lesson of concentration , its already built in. Every child is unique in experiencing , dealing, scrutinizing, feeling and thinking about a particular event or experience, and that's the thing 'Education' should provide them with the opportunities, and not just the 'Instruction' of 'what to think' ? to create Independent thinkers and Innovators. Then I started calling my children one by one to start arranging the farm in their own way and create their own Stories out of it . So every child used his own 'Imaginative skills' to arrange the farm using toy animals and make his unique story. They gathered some grass from the ground (one of the group went out with a basket to bring some). Step by step the farm was taking it's final appearance as Imagined and Created by children. And finally the farm was set . This boy was highly curious to start up his story ,it was about the Cow who loved to walk around the farm and eat .,Amazing ! The listeners were as immersed as the teller. His story was about a horse who loved to jump high around the walls of the farm to search if there/s any one coming from outside. She is the busy bee of my class and loves to share her stories ,this was the chance to get the attention of the whole class, so she created the story of a rabbit who loved to talk. 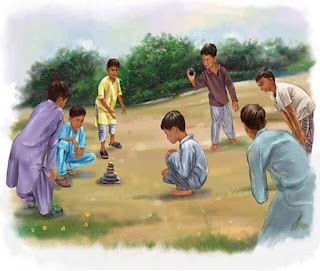 While children were making stories and sharing it, I discovered that the listeners never ever 'Interrupted' the teller ,they showed extreme Patience and so our 'adult-based beliefs' were shaken again. Children kept on coming ,creating and sharing their stories ,its really wonderful to witness how they Choose their Characters, what relationships they make, what situations they create, how they make Links between different situations, how they use the Language . If we really listen to their stories carefully ,we can Discover many things about the child 's unique personality. Many specialist are coming with the idea of PLAY THERAPY to know the exact nature of the child's behavior and to help them in the process of healing. WELL DONE MY LITTLE STORY TELLERS !